For more on our expeditions, go here. [The following is a draft report, which we will continue to update. Corrections and suggestions will be gratefully received. Please e-mail dharris2 AT swarthmore.edu]. Visit Australian Aboriginal and Torres Straits Islander communities to learn about and observe current efforts to stabilize, revitalize and teach their languages. Speak with language practitioners, teachers, and community leaders about their methods and strategies for preserving languages and cultural heritage. Record audio/video interviews with elders and other local experts. Attend Garma Festival and visit ancient rock art sites. Neil MacKenzie, Yawuru tribal member and expert in traditional knowledge, demonstrates medicinal plants. 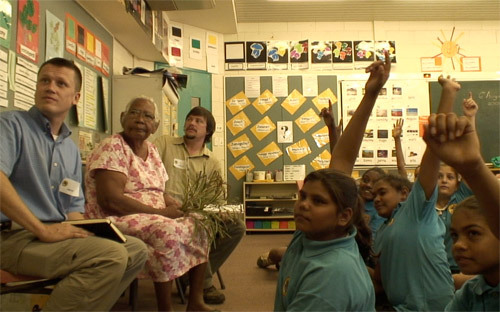 Doris Edgar, tribal elder and one of 3 reported remaining speakers of Yawuru, conducts a language lesson for local schoolchildren using plants. Click to download. To view an interactive version of our itinerary in Google Earth, choose 'Play Tour' in the Tools menu. Ancient cultures: Aboriginal Australian cultures are among the world's most ancient, dating back at least 50,000 years, long before humans inhabited Europe or the Americas. These unique languages and traditions are primarily oral, not written down or recorded, and in many cases still relatively poorly documented by scientists. At least 100 indigenous languages of Australia are now in danger of extinction. The elders (and youngsters!) we met generously shared with us some of their vast knowledge about language, mythology, plants, animals, climate, and human adaptation to a harsh environment. It was a rare privilege to have a glimpse into these amazingly complex and ancient cultures, and their efforts to ensure continuity of the tradition. Revitalization Experts: We began our trip by visiting the Batchelor Institute of Indigenous Tertiary Education, a leading center for Aboriginal language revitalization efforts near Darwin, Northern Territory. Among the specialists we were privileged to interview there were: Ms. Jeanie Bell, who works on Fraser Island languages; Ms. Nazareth Alfred, of the Masi Island Kolpa tribe, who studies the Kulkalgowya language; Ms. Lynette Cockatoo, who is working "to retrieve the traditional Nigarakudi language"; Mr. William Brady, a speaker of Yalangi and expert hunter, and Ms. Leonora Adidi, a speaker and activist for her native Kalawkawawya tongue (also called "KKY"). Each of these dedicated researchers expressed their desire and aspiration to help revitalize and document their language. We also interviewed four members of Batchelor's dynamic book publishing team that produces beautifully designed, high-quality storybooks in many aboriginal languages. River spirits: At Nauiyu Nambiyu, we met linguist Mrs. Patricia McTaggert, a speaker and expert on the Nangikurrunggurr language who reported that she has just completed a dictionary co-authored with linguist Nick Reed after many years of work . She explained that the word "nangi" means 'story' or 'language', while "kurrungkurr" means 'deep water', so the language name Nankikurrungkurr may be literally interpreted as "language of the swamp people". Another language Patricia speaks, Ngengiwumerri, means "language of the sun and cloud people." We were welcomed into the Nauiyu Nambiyu community by elders Mrs. Molly Yawalminy and Mrs. Kitty Kamarrama, who took us down to a nearby river, anointed us with river water, and ceremonially announced our presence so the local spirits would not harm us. The ceremony, which they allowed us to film, included a song performed in the Nangikurrunggurr language. The elders then sat down with us for an extended conversation that included a discussion of traditional ecological knowledge that links "calendar plants" to food gathering activities. When the bark peels easily from the gum tree, for example, sharks in the river are fat and may be hunted. When Kapok tree blooms, say the elders, it is time to gather crocodile eggs. Teeth Dreaming: One severely endangered language that we encountered was Magati Ke (or Marti Ke) spoken in the Wadeye community, of the Northern Territory. Magati Ke is now reported by the community to be down to three elderly speakers. Accompanied by local linguists Ms. Maree Klesch and Mr. Mark Crocombe of the Wadeye Endangered Language project team, who have been working with this community for years with great results, we met with and spoke to three Magati Ke speakers, including "Old" Patrick Nunudjul, who told us a Teeth Dreaming story, which the Wadeye project team told us they had not previously recorded. We also heard Dreaming and rock art stories (e.g., "the headless man") told by Mr. Cyril Ninnal and Ms. Theodora Nandu and others in the Murrinh Patha language, which is spoken locally but is not endangered. A last speaker? Another language we recorded bits ofupon meeting the last reported speaker ofis Amurdag (Amarag, Amurdak), which had been reported in some of the scientific literature as extinct 25 years ago. In fact it was not extinct, and Australian linguists Robert Handelsmann, Nick Evans, Bruce Birch and others had been working with speaker Charlie Mungulda and another remaining speaker over the years. Charlie Mungulda, locally considered to be a "last speaker", told us he had not used the language regularly in some years and remembered words with difficulty. We interviewed Charlie about his language and culture at an important Dreaming site at Mt. Borradaile, a cave adorned with ancient rock art, including an enormous image of the rainbow serpent. Charlie shared stories of the Turkey Dreaming and of the rainbow serpent, which he had heard from his father, with our guide Freddie Bush, and then he helped Freddie re-tell the rainbow serpent story to us at the cave site. Charlie shared with us a number of words (especially names for animals) in Amurdag, which we recorded. Festival life: At the Garma Festival, we witnessed the vibrant present and future of cultural revitalization in song, dance, story and visual arts. We were formally "adopted" by Mr. Oscar Marawali, from the Laynhapuy homeland, and fellow members of his rock band, known as Karangali (meaning "crocodile" in the Yolngu tongue). We also interviewed and saw performances by Yothu Yindi, and interviewed drummer and music impresario Mr. Ben Hakalitz of the Melanesian Funk band Tribe of Jubal. We accompanied and observed a young aboriginal film crewfunded by a grant from the Genographic Legacy Fundas they filmed a documentary about Yolngu cultural survival. Mrs. Trish Pascuzzo of Tourism Australia accompanied and expertly assisted us at Garma Festival and oversaw our entire itinerary, travel, permits and journalistic credentials. Walkabout: In Broome, Western Australia, we spent most of three days walking through traditional lands with Rubibi elder and expert guide Mr. Neil McKenzie. 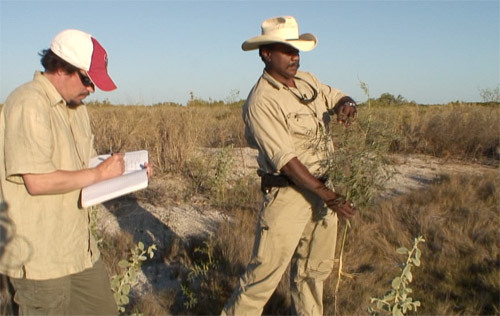 We filmed Neil as he demonstrating well-digging, medicinal plant use, wayfinding skills, hunting and tracking techniques, weather prediction, and many other traditional Yawuru cultural survival skills. We were impressed by Neil's breadth of knowledge and strong sense of cultural groundedness. He was not, however, very optimistic about the future of his own Yawuru culture, and he described how it is now threatened by indifference and outside influences. He emphasized the importance of the landscape to language, saying: "If I don't show you these things [e.g., landscapes], you won't understand the language. It exists because of the land. It is in close harmony with it." A "dying" language: In Broome, we observed the wonderful efforts of the Yawuru language community, now reportedly down to about three fluent speakers and perhaps a dozen speakers of other levels of fluency, to revitalize their language. A Yawuru elder, Mrs. Doris Edgar, allowed us to observe and film a Yawuru language lesson she conducts for students at Cable Beach Primary School. It was truly inspiring to see the children understanding and speaking what they referred to as a "dying language," and expressing so cogently their strong desire to help it survive. We also interviewed Yawuru elders Mrs. Susan Edgar, her mother Mrs. Elsie Edgar, and Mrs. Thelma Sadler, who at age 97 when we met her may be the eldest living speaker of Yawuru. In a surprise, unplanned encounter on our last day in Broome, we were taken by our guide, Neil McKenzie, to meet his "auntie", an elder from Sunday Island, Ms. Patricia Ahchoo, who said she spoke a variety of the Bardi language and had formerly taught it in a local primary school. Patricia also told us she was among the last speakers of the Djawi (Jawi) language, and the team conducted a brief interview with her. We also interviewed Dr. Joyce Hudson, a Walmajarri language expert who helped us understand the complex map of languages in the region, and told us a bit about the local vernaculars "Broome Talk" and "Kimberly Kriol". Dreamtime painting: A highlight of our visit to Broome was two visits with talented Walmajarri musician and painter Mr. Clifton Bieundurry, lead singer for Groovy Lips and the Yang, a group featuring digeridoo, guitar and song. Clifton expresses the dreamtime past and envisioned future of his people in song and painting. He is widely recognized as a leading figure of the young Walmajarri generation, and his artwork has been exhibited around the world. We filmed an interview and performance by Clifton at the Old Broome Lockup Gallery. New media: TEABBA Radio runs an impressive and polyglot program of broadcasts that covers much of the Northern Territory and brings the airwaves alive with the sounds of multiple languages. At TEABBA, we interviewed court translator and Anindilyakwa language activist Nancy Lalara from Groote Island, who cheerfully asserted "Our language is the hardest language". At Skinnyfish Music in Darwin, we interviewed label co-founder Michael Hohnen about the current state of Aboriginal popular music. Skinnyfish is a leading promoter and talent spotter for dynamic young performers like Saltwater Band. As Michael Hohnen eloquently noted: "What's ancient in Australia is not in the seeing, but in the hearing." Skinnyfish Music is doing an excellent job of connecting ancient musical traditions to modern media technology. At Goolari Radio, an aboriginal-run media company in Broome, we met Bard speaker and entertainer Mr. Bamba Banial, who told us some pearling legends of Broome. He stated that "TV is becoming a survival kit for our languages...we want to edutain" Also at Goolari, Mr. Stephen Albert, chair of the Broome Indigenous Music Association, remarked that "media is critical to the self-identity of the indigenous people." At Kimberly Interpreting Services, we learned about the challenges of maintaining multilingualism and supporting indigenous languages in business and education. Powerful images: Our colleague and Enduring Voices project director at National Geographic, Mr. Chris Rainier, is a world-renowned photographer, expert videographer and the driving force behind much of this expedition. Chris is both a visual anthropologist and a conservation photographer. Far from assigning a passive, portraying role to photography, Chris believes that it has the power to shape fundamentally how people think about global problems like language endangerment. Chris produced many powerful still images and video recordings during this expedition, which will influence both perception and action relating to language endangerment and revitalization. We were grateful to be working with such a committed and talented artist on this (and furture) expeditions. Chris' photograph of Greg Anderson and David Harrison interviewing Charlie Mungulda at the rainbow serpent cave was widely published in newspapers in 2007, including the New York Times, accompanying stories about the launch of our global language hotspots model. Our role: In our role as scientists on a National Geographic expedition, we are working to raise public awareness of the global crisis of language endangerment, and efforts at language revitalization. Since parts of Australia are also within a language hotspot, we hope to use information gathered there to refine our emerging model of global language hotspots. In Australia, we were strictly interested outside observers on a fact-finding trip. We are not engaged in the documentation of Australian languages, work which is being expertly done by many scholars. We are fully aware and supportive of the many linguists and anthropologists who are working in the region. We've sent copies of our recordings back to the communities that originated them, and are also offering to share them, as permitted by those communities, with interested scientists from outside the communities. Our focus on this expedition was on talking with local, Aboriginal language experts and hearing what they had to say for themselves about language revitalization and cultural survival. We hope to use these materials in the future to raise awareness of the global crisis of language endangerment, and to attract greater interest, attention and resources to this kind of work. We are currently working with three local groups in Australia to help obtain grant funding for their projects. Selected Press: World Talk podcast: Host Patty Kim interviews David Harrison by phone from Darwin, Australia, August 2007. Also available via free through iTunes. (This interview was edited down from the original recording, and thus does not contain the full content of the original conversation). Sponsorship: This was the first in a series of expeditions sponsored by the National Geographic Society, Mission Programs. It was expertly organized by Tourism Australia and Tourism Western Australia with sponsorship from them and from Qantas Airways. At every location we visited we were met, welcomed, and assisted by expert Aboriginal consultants, and also by local non-Aboriginal experts. We are very grateful to the dozens of people who assisted and taught us on this expedition, some of whom are mentioned here by name. Disclaimer: This draft report is authored by linguists Dr. David Harrison and Dr. Greg Anderson. Comments and corrections are most welcome, if sent directly by e-mail to dharris2 AT swarthmore.edu. This report is the sole authorized, public report on this expedition authored by the Enduring Voices team. Any other information, including journalistic articles, blogs, audio, or video material that may be in circulation, should be checked with our team before assuming accuracy. We emphasize that a short, 3-minute video clip produced by "Wild Chronicles" / National Geographic for PBS, using our film footage from this expedition, is wholly an interpretive work of art produced by others, and cannot be assumed to accurately portray or represent our work, methods, attitudes, values or experiences. Spellings of language names and ethnic group names in this report are reported here exactly as they were given to us, and may differ slightly from alternate or more common ways of spelling these names. The Kallawaya, herbalist healers whom we visited in Bolivia in June 2007, cleverly anticipated the information age by half a millennium. They realized that although they could not restrict access to the specimens (nor patent the knowledge) of the thousands of medicinal plants they had discovered, they could encode their specialized knowledge in a secret, mixed language to be transmitted only within practitioner families and between males (e.g., (grand)father to (grand)son). Despite the 400+ year interlude since the fall of the Inka empire, and the widespread use of the Quechua language in the community, the Kallawaya have preserved their secret language, maintained their elite position as healers that attract a national and international clientele and also achieved the (moral but not legal) protection of being recognized by UNESCO as part of Bolivia's (and the world's) intangible cultural heritage. We are very interested in the problem of intellectual property vis-a-vis small languages and the knowledge they contain. Western legal regimes have neglected to provide any protection for ideas that are not individually-attributable "eurekas", but rather bodies of collective knowledge worked out and passed down over millennia. The threat of bio-prospecting, so thoroughly exposed by the late Darrell Posey in his work, is that companies will swoop in and (legally) steal traditional medicinal knowledge possessed by indigenous peoples, profiting handsomely while paying them no royalties whatsoever. Kallawaya is an excellent example of a language that could be patented for both its form and content, for the economic well-being of the community that invented it, and for protection against predatory pharmaceutical corporations that seek to exploit that knowledge without recompense. This research is in collaboration with Bolivian scholars Ricardo Lopez and Jose Lara Yapita, coordinated by the Living Tongues Institute for Endangered Languages. It is featured in the film "The Linguists" from Ironbound Films.